As soaring food prices threatened to push 100 million more people into starvation, heads and representatives of 180 countries gathered in Rome in the first week of June to find ways to overcome the crisis. The situation was extraordinary--global food prices have almost doubled in three years and the Food and Agriculture Organization (fao) predicts the trend is not going to ease in the short term because global grain supplies are at their lowest since the 1980s. Inflation has triggered protests across the world. "If we do not urgently take the courageous decisions that are required, the restrictive measures taken by producer countries to meet the needs of their population, the impact of climate change and speculation on futures markets will place the world in a dangerous situation," said fao Director General Jacques Diouf.But the response at the fao Conference on World Food Security was anything but extraordinary. The declaration adopted by a fractious gathering of world leaders failed to live up to the promise held out by the conference. It called for ramping up investment in agriculture, but was vague and non-committal on issues of biofuel, agricultural trade and climate change that required tough decisions. Although the declaration spoke of halving global hunger by 2015--as per the Millennium Development Goals--it shied away from proposing any radical shift in the world agricultural policies to achieve the goal. Argentina and other Latin American countries refused to adopt the declaration without amendments, saying there was an over-dependence on the International Monetary Fund (imf) and the World Bank, which had been responsible for distorting agricultural policies in developing countries in the first place. 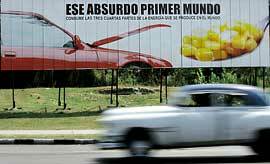 Cuba criticized "lack of political will among countries of the North to resolve the crisis". One of the main objections of the Latin American countries to the declaration was the absence of any reference to farm subsidies rich countries, especially the us and European nations, give to their farmers. These subsidies depress food prices, making it difficult for farmers of poor countries to compete. This discourages investment in agriculture in developing countries. Argentina's government said in a statement, "Argentina is formally registering its dissatisfaction with a text that, while dealing with the question of food security, doesn't include a single reference that uses the term 'agricultural subsidies'." Brazilian President Luiz Inacio Lula da Silva had also called for an "end to intolerable farm subsidies". While urging rich nations to open markets for agricultural products and eliminate farm subsidies, un Secretary General Ban Ki-moon, in his keynote address, also asked countries to lift export restrictions on foodgrains and oils. About 40 food-exporting countries, including India, have imposed trade restrictions on food. 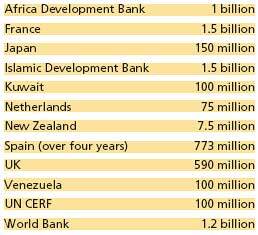 But most of these countries are poor and have taken the step to safeguard their domestic food supply. It became a point of contention when the draft declaration called for "the need to minimize the use of restrictive measures that could increase volatility of international prices". The clearing of the declaration draft was not without an element of drama. Latin American countries, Argentina, Venezuela, Cuba, Ecuador and Nicaragua, almost stalled the proceedings, demanding that the term "restrictive measures" be removed from the draft. They agreed to give their consent to the draft only after being assured that their objections would be annexed to the declaration, but the the term remained. Venezuela accused the conference was dominated by the us. Asia, Africa, us (on behalf of Canada and Mexico) and the eu accepted the proposals; Italian foreign minister Franco Frattini called them disappointing. The final declaration stresses lifting of trade barriers and "market-distorting policies", saying nothing of farm subsidies that distort the entire economics of food production. Indian agriculture minister Sharad Pawar said trade liberalization must adequately take into account the livelihood and food security concerns of poor farmers in the developing and least developed countries. "Implementing an aid-for-trade package should complement the Doha Development Agenda (of the wto) to improve the trading capacity of the developing countries," the declaration stated. "Trade negotiations can be part of the medium- and long-term response to the crisis," said Pascal Lamy, wto director general at the plenary session. 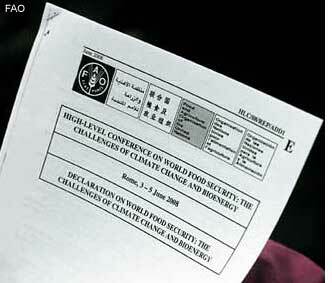 Climate change is cited as one of the reasons for the shortage in food supply. The signs are all too worrisome. Farmers in Australia, Ukraine, Canada and Syria suffer droughts. American corn and soyabean farmers suffer from heavy rain. But the declaration failed to read the disjointed danger signs and come up with a document to address the challenges before the world. It made only a feeble plea to governments to give "priority to agriculture, forestry and fishery...to create opportunities to enable the world's small-holder farmers and fishers...to participate in, and benefit from financial mechanisms and investment to support climate change adaptation, mitigation and technology development and dissemination". Civil society groups said there was no hope of a concrete outcome. "The only good that the conference will do is bring agriculture into the spotlight. But beyond that it seems to be opening avenues for only big companies, not small farmers," said Flavia Valente, secretary general, FIAN International, Germany. The participants also questioned the absence of the fao co-sponsored report, International Assessment of Agricultural Knowledge, Science and Technology for Development, from the agenda. The report recommends support for small-scale agriculture and attacks biofuel and intellectual property rights. At the three-day conference, ngos and civil society groups were permitted only a 90-minute forum with an agenda set by the fao. They were not even invited for the private-sector roundtable addressed by former un secretary general Kofi Annan, fao's director general Jacques Diouf and agribusiness representatives like Monsanto and Syngenta. An fao official said on the condition of anonymity that there were apprehensions of protests by farmer groups and activists and that's why the fao building was cordoned off. The press was kept away from delegates. The final press conference of the meet was postponed by an hour and a half because there were disagreements on the final document to be read by DG Diouf. According to fao sources, the dispute was to do with biofuels and the liberalization of agricultural trade. The delay did not come as a surprise; an undercurrent of dispute, stemming from differing concerns, was there all through the conference. The rich nations of the North brought their own agenda to the meet, which was to defend their right to alternative fuel and therefore their interests in biofuel. The South was more concerned about feeding its hungry and protecting the interests of its farmers, which would happen when agricultural trade became fair. "Nobody understands how 100 million tonnes of cereals got diverted from human consumption, mostly to satisfy a thirst for fuel for vehicles"
"It is frightening to see attempts to draw a causeand-effect relationship between biofuels and the rise in food prices"
Biofuel thus had to become a sticky issue at the conference. The president of the Arab Republic of Egypt, Mohammed Hosni Mubarak, called for international guidelines for utilization of biofuel as an alternative source of energy. "In some cases biofuel production is in competition with food supply," Japanese Prime Minister Yasuo Fukuda told the gathering. "We need to ensure that biofuel production is sustainable." Studies by international organizations, including the imf, indicate that the increased demand for biofuel is contributing between 15 per cent and 30 per cent of the food price rise. Ed Schafer, the us secretary for agriculture, contested that biofuel was responsible for only 2-3 per cent of the predicted 43 per cent rise in food prices in 2008. Pawar cited fao data, which stated that high commodity prices were not triggered in emerging economies. Instead, maize and rapeseed being diverted for feed stock and production of ethanol and bio-diesel, along with the rising agricultural input costs due to high fuel prices, had the greatest impact on rising globalfood prices. Brazilian president Lula's was the only discordant voice among leaders of the South as he had to protect the interests of sugarcane farmers of his country, who had found a lucrative market in ethanol. He countered the criticism by emphasizing that the ethanol produced from sugarcane in his country was clean and had been in use for long. "It is frightening to see attempts to draw a cause-and-effect relationship between biofuels and the rise in food prices," he said. Schafer too sought a clean chit by insisting that the corn-based ethanol was not driving up food prices. "The ethanol-based fuel policy of the us is the right policy in the right direction," he said. The question is, right for whom. The American biofuel policy had diverted use of land from growing corn for food to growing corn for fuel. The Brazilian president criticized the us approach, saying corn-based ethanol was less efficient than the fuel produced with sugarcane and can only compete with it when "shored up with subsidies and shielded behind tariffs". The us has been heavily subsidizing production of corn-based ethanol. According to the World Bank, the country has set a target of 28.4 billion litres of biofuel for transportation by 2012. Last year, the eu endorsed a bioenergy plan to supply 10 per cent of the fuel for road transportation by 2020. According to fao, biofuel accounted for one-third of maize production in the us in 2007. Maize prices peaked to a 10-year high in February 2007 despite record production growth in 2006-07. 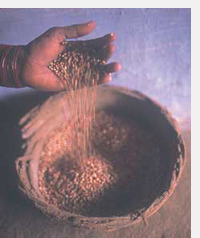 The June 2008 fao report suggests that total utilization of grains for ethanol production in 2007-08 is estimated at 98 million tonnes, up 40 per cent from the previous year. "That absurd first world consumes three quarters of the energy produced in the world"
The conference, till the very end, did not address the challenge to world food availability from biofuels as its title said it would. It failed to come with international guidelines for biofuel policy. All that the declaration said was that an "in-depth study was necessary to ensure that production and use of biofuel was sustainable...and maintained global food security." No tough stand was taken on grain being converted into fuel despite the un Right to Food rapporteur, Jean Ziegler, stating that "biofuel was a crime against humanity". The un acknowledges that in the past few decades governments and international financial institutions have not paid any attention to agriculture. 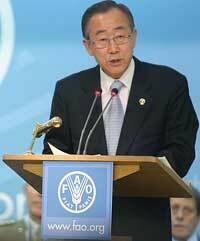 Now the un, states and financial institutions plan to invest in agriculture to ensure food security. Just before the conference at Rome, the World Bank came up with its 10-point plan to tackle the crisis and announced us $1.2 billion food assistance. Civil society groups point out that the imf and the World Bank had never shown pro-poor approach. "Their approach was largely helpful for agribusiness and those who were making profits," said George Dixon Fernandes, president, Internal Movement of Agricultural Rural Youth (mijarc), a farmers' organization. 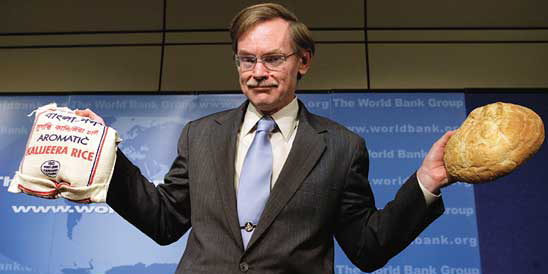 un humanitarian chief John Holmes, however, said, "The World Bank and the imf seem to have changed their approach now." But have they? Many observers fear bank loans will come with tariffs and subsidy cuts, which have been responsible for the inflation.The bank has said that to address immediate and long-term challenges, it would boost its support for global agriculture and food and launch risk-management tools and crop insurance to protect poor countries. Farmers' and civil society groups remain skeptic. They think that big agribusinesses will again flourish in the name of agricultural growth and small farmers will be ignored. Herman Kumara, general secretary, World Forum of Fisher People, Sri Lanka, said the fao meet had ignored "the claims of social movements for more protection to small farmers, land and agrarian reforms along with strong measures to safeguard farmers against market speculations". 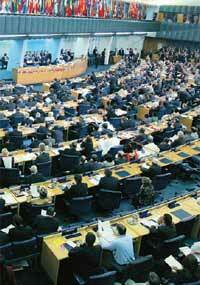 Private players, like the International Seed Federation, International Fertilizer Association and the International Feeds Association, played a more prominent role at the conference than any other un conference. It is only the big companies who have profited enormously out of the food crisis, said Dena Hoff of the National Family Farm Coalition, a farmers' movement based in the us. Agribusiness behemoth Cargill announced that its profit had increased by 86 per cent in the first quarter of 2008. Profits of Cargill's Mosaic Corporation, which controls much of the world's potash and phosphate supply, more than doubled in 2007, says GRAIN, an ngo working for agricultural biodiversity. The same year, the world's largest potash producer, Canada's Potash Corp, made more than us $1 billion in profit, a 70 per cent increase since 2006, it added. In April 2008, the joint offshore trading arm for Mosaic and Potash hiked the price of its potash by 40 per cent for south-east Asian buyers, and by 85 per cent for those in Latin America. India had to pay it 130 per cent more than last year for potash. In the wake of the rising food prices, gm technology was being touted as a means of boosting production. Though Holmes had said that gm crop was on the conference agenda, it was not mentioned in the declaration. "Not only are we unsure about the health aspects of genetically modified crops, introducing them would also mean a lifelong dependency on big multinationals," said George Dixon Fernandez, president, MIJARC, a Brussels farmers' group. During the conference several countries and international banks and donors pledged funds to fight hunger and help agricultural development. "We are yet to have talks with them (donors) to identify the terms and conditions of the aid. However, this is a good beginning. We had requested for us $1.7 billion but have received much more than that. This will help us assess the problems country by country and start a market study to ensure that farmers get good seeds, good irrigation facilities, infrastructure and storage capacity for the forthcoming growing season," said Diouf. Countries in need of aid, however, will have to wait until the G 8 summit in Japan to be held in July. "The question is will the money promised this week be in addition to previous commitments, who will be spending on it, on what and when? Ideas in Rome must be followed by cheques in Japan," said Barbara Stocking, director, Oxfam GB. The World Food Programme (wfp), which has pledged us $1.2 billion of food assistance to 62 most vulnerable countries, has assured that it would make purchases in developing countries to support farmers there. The funds will be used for both immediate relief and long-term investment in agriculture to boost production. The un secretary general said the world food production needed to rise by 50 per cent by 2030 to meet the growing demand. In the wake of the food crisis, several African nations decided to go for modern agriculture on the lines of the Green Revolution in India. This got an impetus with the setting up of the Alliance for Green Revolution in Africa (agra) in 2006 by the Rockefeller Foundation and the Bill and Melinda Gates Foundation. It is an organization of farmers, agro-dealers, scientists, private firms, African national leaders and institutions. During the meet, agra, headed by former un Secretary General Kofi Annan, signed a memorandum of understanding with wfp, International Fund for Agricultural Development and fao to boost food production. What has not gone down well with civil society groups and ngos is the fact that though agra says it is supporting small farmers, Annan held a separate meeting with private players, including the International Seed Federation, International Fertilizer Association and the International Feed Association, and not them. Neither agra nor the companies mentioned the meeting in their press conferences. "Had small farmers been on the minds of the leaders they would have consulted farmers' organizations instead of holding a private event with private companies. The talk about small farmers is just lip service," says FIAN International's Flavia Valente. agra's policy and partnership vice-president, Akinwumi A Adesina, however, said the alliance was working with seed companies in Africa because "Africa alone, and not transnational companies, will have to solve its problems" (see interview). Though Africa is not talking of genetically modified (gm) crops, it is definitely looking at producing improved varieties. Marcel Bruins, secretary general, International Seed Federation, agreed that the focus of the federation should be on Africa. "It is estimated that 85 per cent of African countries are not members of any of the seed related federation," he said. Seed. Subsidies. Liberalization. The countries of the South have all too often seen their hopes dashed at international conferences, where they have found themselves pushed to the corner unable to stand up to pressures from rich nations of the North. But this time it was different. There was hope, the world food crisis conference in Rome would come up with sincere policy decisions that would address the challenges to food security. But it failed to discuss the challenge to food security from biofuels and climate change; it failed to take a tough stand on either. Nor could it persuade rich countries to bring down farm subsidies that are distorting agricultural trade. States and financial institutions agreed that their agriculture policies had failed and there was a need to increase investment in agriculture, but beyond that there was no sign of a fresh approach. Like so many international negotiation rounds before, this conference too saw the urgent needs of the world's poor hijacked by the interests of the rich and powerful nations.